Experience the stable and secure progression during your workout on roller skis with real wooden composite construction ski frames. 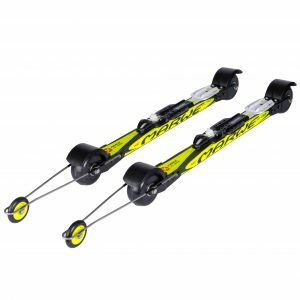 These skis offer the best possible skiing feeling combined with properties which will make you almost forget the lack of snow and track to ski on. The perfect choice when you want to experience almost the real thing -but without snow! 700XC is the most snow-like feel of any classic rollerski on the market. The lightweight flexible composite frame minimises road vibrations for a smoother ride, and flexes underfoot like a classic ski. It is also a very stable roller ski. Due to this it is the ideal companion for even beginners to start their classic style roller skiing hobby in an easy and safe way. The skis support wheels simulate a cross country ski tip, providing better steering properties and extends the skis total wheelbase from 590 mm to 800 mm. The longer ski frame provides extra skiing comfort. The Classic 800XC has flexible XC wood composite frames which provide outstanding vibration damping properties, especially when skiing on uneven surfaces. Can´t decide if to ski Classical or Skating style? With the Universal 800 XC wood composite roller ski model you can do both. The ski tip perfectly simulates the real thing – kick-motion during cross-country skiing. 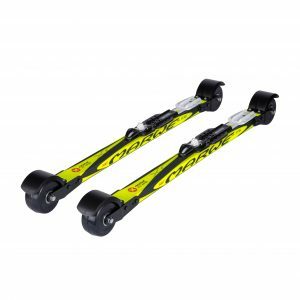 At the same time, the model offers outstanding vibration damping properties which makes skiing on them pleasant.